Thanks for looking at this project. Any comments and suggestions are appreciated and welcome. I will reply to all of you Lumberlanders out there who take time to “have your say” in the next 24 hours, so check back for feedback. 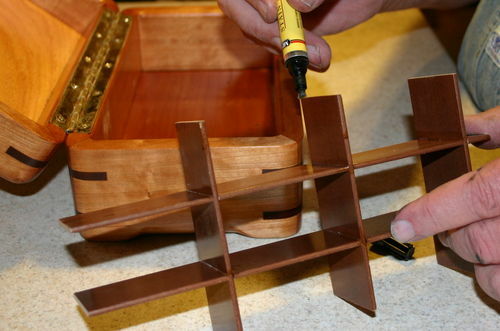 There is a tutorial index at the end of this posting that will show you how to build the jigs and learn the techniques for building boxes like this tea box. 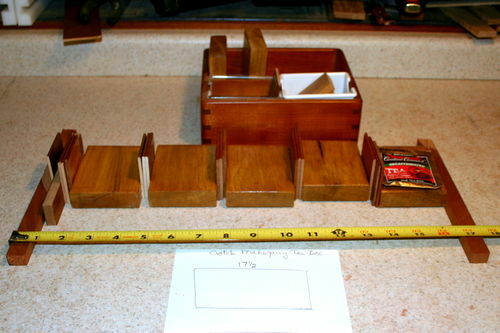 You can find a new, extensive tutorial on sizing tea boxes and using Venetian blinds as dividers by clicking here. 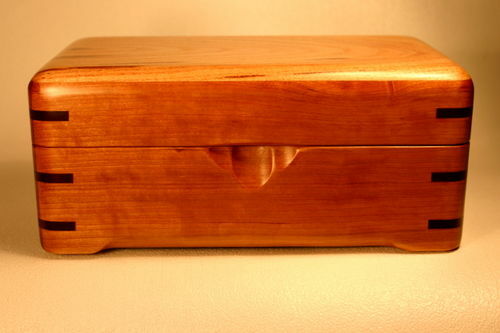 Pictured is a small tea box (10 3/4” long, 6 inches wide, and 4 1/2” high) made of woods local to southern Indiana. The top is Honeylocust and the sides are Black Cherry. The corner splines are Black Walnut. The inside dividers are made of recycled Venetian blinds. Story: This top board has many nice things going on I like the grain and the striations that flow along. 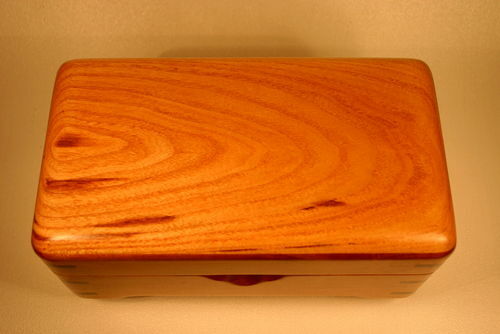 It looks really nice next to cherry and I wanted to make a tea box that would celebrate these colors and woods. On the bottom, I used the faux-feet design that Andy developed. They are made with the same roundover bit I used for the top. I just stopped the router cuts before I got to the corners. It gives the box a nice light look. Focus: This tea box uses wooden Venetian blinds for dividers. I won’t go into that here since it is covered in this tutorial. Here are some previews of the tutorial. Pretty slick idea using blinds for dividers !.....Beautiful box !...Great instructions !....Well done ! Another great box, I appreciate your tutorials and find myself continually referencing them. One question I have is, how do you get the inside curve on the corners? WoW! Another great build. Where do you get old wood blinds? KDC68, thanks for the compliments. I really liked your conversion of the dust collector. Nice work. 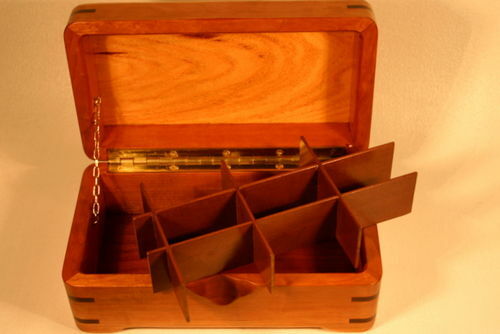 The box you made using the Fine Woodworking plans is really stunning. Great job there too. Daniel, good question. How do I round the inside corners? After I have cut the box into a top and bottom using the table saw, I run the box through the dual drum sander to get the fit of the two halves flat and free of any burn marks. Next I head for a board-mounted router with a 1/2 inch roundover bit with a bearing on top. I turn the box over and run the inside edge of the top around the three sides of the box that are not going to get a hinge. Then I do the same on the bottom part of the box. 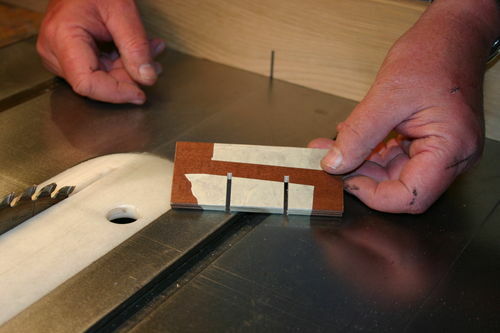 The curve is a result of the bearing on the bit following the inside edge of the box and touching the sides at once, but not the inside corner as it makes the turn. The curve is an illusion caused by the bearing touching the two sides of the corner. 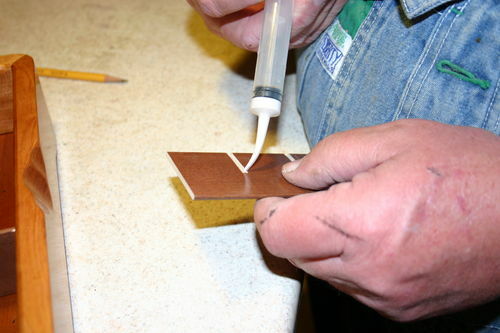 Sandpaper wrapped around a half inch dowel will quickly sand away any burn marks in the corner and keep the curve intact. 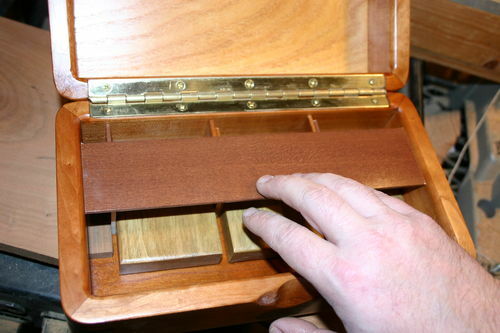 Having a curved inside edge of the box makes reaching inside easy on the fingers, and gives it a nice look too. Thanks, it is nice to hear that the tutorials are of use to others. Topa, asked where do I get the blinds? Friends help me look, but I check Goodwill and Habitat recycling. I watch for restaurant remodels, as a last resort you can check Home Depot and Lowe’s for new blinds or miscut blinds or sales on blinds. 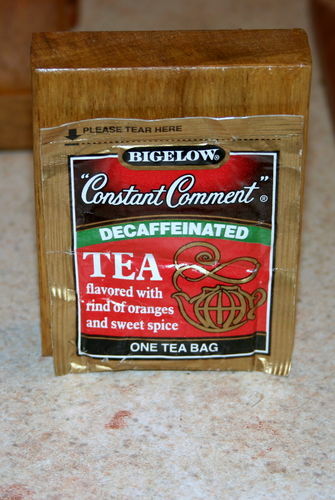 Most run me about 20 cents a slat, even at a dollar each they are worth buying. I will spend more than that on planing and finish coats when I make them myself. One blind gives you lots of slats and I like to have several colors available to choose from. Another beautiful box and wood Big Al. I always look forward to seeing your creations….thanks for sharing and for the tutorials. That’s a nice looking box Al. I love the idea of the blinds and thanks for the tutorial on that very well done ! Not only is your box beautiful but the same goes in the way you explain your work and show it in a tutorial format. You set the bar in every way with your work. 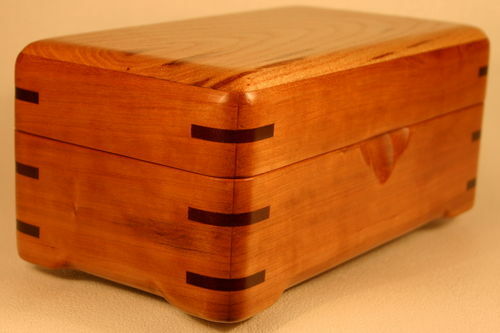 There are many more box makers out there that do some really nice work also but when I view your page I feel like I’m looking at a my favorite wood working magazine . Excellent work! Great box, and wonderful pictures and explanations. Great work, and a joy to read. I’d never thought about reusing wooden blinds … and after my first glance at the blinds in my office, I decided I should keep my hands off of them! Garage sales it is. 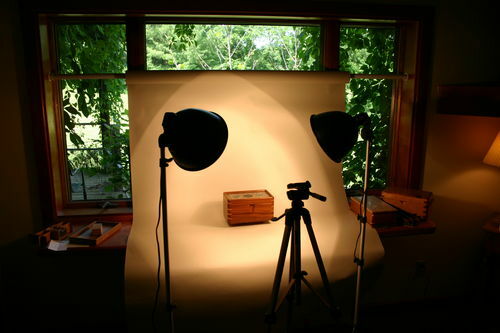 We all have seen your Box-making abilities, and appreciate your dedication to teaching your methods, but when are you going to do a tutorial on your Photography?! You always do a flawless job making images of your work as well, that is not easy! Great Job on that, and on everything! Great looking box and we all appreciate the work you put into the tutorial. Al, it’s another great box. You are so talented. Thanks for the tutorial! I have Favorited it and will make a couple for gifts. Nice piece, very subtle, and I already thanked you for the blog! LOL! Very nice box & tutorial. Dave, thanks for the very kind words. Judging by your cabinet work and the lovely redwood doll cases you made, you shouldn’t need much coaching. But maybe you can find a tip or two in the tutorial. Kiefer, I liked your grandkids’ money boxes that you posted about the same time as this posting. Those look like a great gift idea for kids. Grandpa projects are the most fun to do. Keep boxing and keep posting. Tony, wow, what nice things to say, thanks. That top you posted recently looks like a great idea for my next “Gwanpa Project.” I have gotten several such ideas from this site. Henry, probably best to keep your mitts off your office blinds, but maybe there is an office or two down the hall! California is a great place to find Venetian blinds. Seems like every window out there has some once you start looking. Little Cope, Mike, thanks. In your “Sorry But” box (hope “But” is with just one “t.”) You talked about how some boxes just seem to go smoothly and seem to want to be built. This box was one of those smooth builds. It sure is nice when those come along, isn’t it? My photo techniques are pretty primitive. So I can do the tutorial right here. I use a 15-year-old Cannon EOS Rebel and run the photos through Picassa. There is nothing magic about the techniques. It is just taking time to do it and learning how to use the programs and equipment. I leave my camera set on automatic. As you can see, my “studio” is two flood lights and a roll of paper on a plastic pipe. I bought the lights and paper at the local camera store. Charles, thanks. I don’t know about having talent so much as I have greatly improved in my abilities to correct my mistakes. However, I keep finding new ways to screw up so I have to keep finding new ways to fix them. This process generally comes under the category of “experience.” I still can’t convinced my darling wife about the wisdom of this philosophy. She keeps asking me, “So tell me again…why did you mess this up to start with?” I never have a good answer for that one. Toolz, Larry, have fun with your tea box build. If I can help, just ask. Keep boxing and keep posting. Doc, Thomas, if this box were a little more rustic it would be filled with Wabi-Sabi. Maybe in another 50 to 100 years it will be. Nothing is perfect. Nothing is finished. Nothing is permanent. Dennis, I envy your carving and marquetry skills. They are masterful. Thanks for sharing those with us.